The first two, published in Nature Communications and Science Advances, and co-authored with MIT Fellow Hoi Chun "Adrian" Po, Ph.D. '18, and Professor Haruki Watanabe of Tokyo University, lay the groundwork for bridging the relevant abstract mathematical concepts with the pragmatic problem of materials discovery. The second, published in Nature this February and co-authored with Po and Feng Tang and Xingang Wan, from Nanjing University, demonstrates the power of the approach and predicts thousands of topological materials candidates. "In the early days, a lot of effort was focused on being able to predict whether a material would be an insulator or metallic," Vishwanath said. "About 10 or 20 years ago, though, people realized we could produce these topological materials." "Insight into the mathematics of these exotic materials would help us find real materials with these topological properties," Po said. "Right now, the way people do this is really more of a guess … what we wanted to do is to come up with efficient ways of diagnosing whether the materials you're interested in have a good chance of having topological properties." The insight required provides a good understanding of how the behavior of the electrons is intertwined with the symmetries of a material's crystal structure, which can be viewed as an almost infinite array of atoms assembled into delicate patterns. These patterns often remain unchanged if you tilt your head by 90 degrees, or reflect them in a mirror. In physics this property is known as symmetry. In the first two papers, Vishwanath and his collaborators performed a systematic study on this intriguing intertwinement between electrons and symmetries. "The first problem is the huge number of ways in which atoms can form crystals," he said. "Even if you forget about the chemical complexity, forget about which elements are in there, just in the structure … just from symmetry considerations, there are 230 ways in which you can put atoms together into crystals." And the complexity doesn't end there. When magnetism is incorporated the number increases dramatically, from 230 to 1,651. 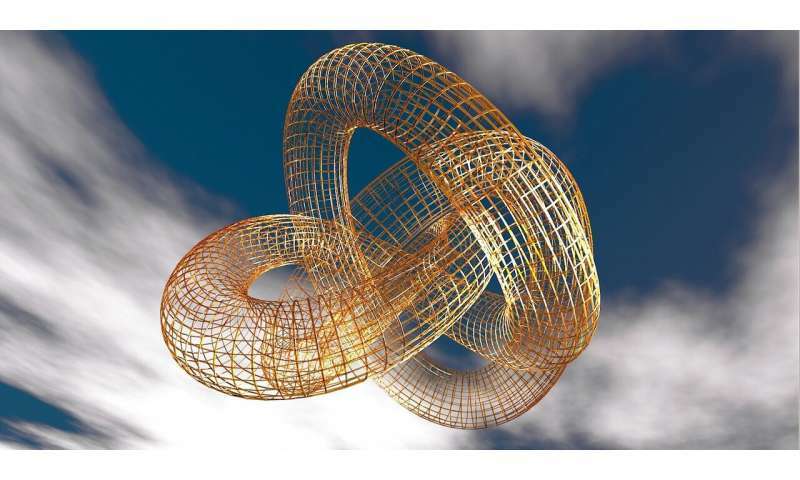 One solution to the problem, Watanabe said, would be to simply test every possible combination to arrive at an eventual solution, but that doesn't offer any insight into what creates the topological states researchers are after. "We took a different approach," he said. "The key idea was … we found an efficient way to reformulate the problem such that the symmetry properties of electrons are mapped to coordinates in some high-dimensional space." Importantly, this "postal code" can be readily characterized. "While the analysis of each magnetic space group would previously have taken a graduate student a day to figure out," Po said, "our new formulation allows for a simple automation of the task, which is completed on a laptop for all 1,651 instances in half a day." "In a way, it's stage two," he said of the Nature study. "It proves the utility of the symmetry indicators." "It's not a complete free lunch," he said. "It's not that you look at the crystal and analyze in detail what the electrons are doing. Rather, we're only looking at a very small aspect of a complicated system, so it's a bit like Sherlock Holmes—from a very few clues we can actually infer a lot about the characteristics of a system." The hope, Vishwanath said, is that these studies will pave the way for developing a "library" of topological materials that can then be further characterized and potentially used for a wide variety of applications. "There are some materials which are predicted to have topological properties, but for which we don't have an example," he said. "In other cases, we may only have one kind of topological state … but we may want to have others, not just the one example people have found before."